Another ASDC come and gone but we won’t have to wait as long for the next one! With the sad news that ACC will no longer be held, ASDC has moved into that time slot and will be MLK weekend in January 2015. YAY! I, for one, am very excited for the move – there is so much going on in the Springtime that the move to January actually makes it a bit easier for us. Another fantastic event. During the weekend, they spoke of the “Dream Team” DJs of Victor Loviera, Cher Peadon and Ruby Lair – that is not an exaggeration! Three of the most talented and well respected DJ in all of WCS and we got all three of them for the weekend. I have to say that the event directors are a bit a “dream team” themselves. 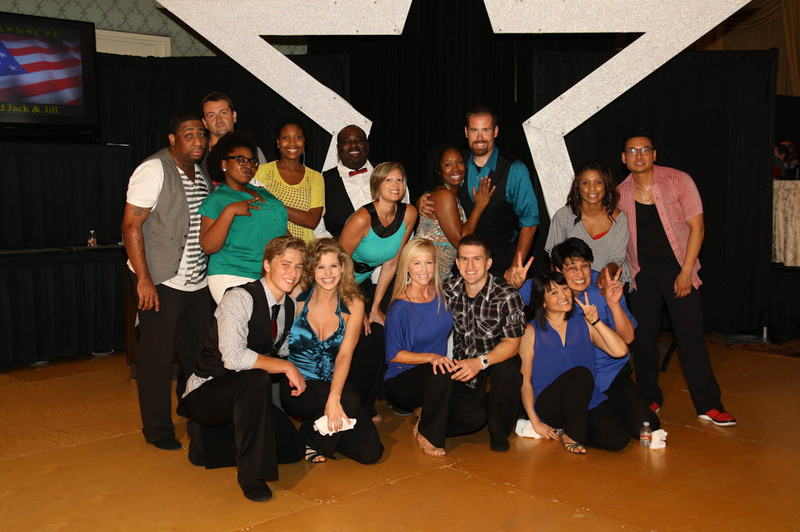 You’ve got Rick Domalski, who has traveled and competed for years – he knows what competitors and social dancers want. Then Angel and Debbie Figueroa – amazing champion dancers, but beyond that, they also have vast chief judge experience and know how to keep an event running smoothly. You add in Mike Topel, yet another well known, well organized chief judge and the event, at least from an attendees’ point of view, was the most well run I’ve ever attended. Every event has its issues, no matter how well planned, but I don’t really remember having any UGH moments regarding timing of events or things running ridiculously late. In fact, there was even time for dinner on both Friday and Saturday nights for us before the evening activities! Really rare of us. This year was also very special to us as we were bringing the first ever SSQQ WCS Team out on the competition floor. These are all people who represent the studio we work for, either as staff members or long time students. With Michael Stephens, we had the privilege of being their choreographers, their coaches and for this event, part of their dance team to sub in for dancers who couldn’t make the event. Most of the folks on the team have never been to a full weekend event before, let alone actually perform at an event. We were truly proud of them and how they performed and it made me very very happy to get to share the experience with them. It gives me so much joy that they enjoyed themselves so much that they are ready to perform again. That’s dance JOY, people! It’s back to work this weekend with the team to prepare for our next performance at Swingapalooza! I’ve had a couple of days now to recover, although I did have to go back to work on Tuesday. I used take that Tuesday off – something I need to remember for next year! It was also a weekend of some personal triumphs for both of us. We both get a bit insecure from time to time about our competition status as we aren’t getting any younger and sometimes we wonder if we can keep up! It was only my 2nd time to make finals in a jack and jill at this event at any level and my first time to make strictly finals ever! To have done both at the same time was so exciting and so shocking. And then to have placed in both (5th in JJ, 3rd in SS) was just icing on the cake. Thank you so much for all my dance partners for taking care of me: Tommy, Shane, Byron, Mike, and Jay in JJ and Jeff in SS! It was also my first time taking the floor as a pro at Dallas Dance in the Female ProAm division. The last time I was on the floor in a proam routine was with Trent in 2007! I was a little nervous, but as usual when the music started to play, the nerves went away. Matthew did a fantastic job – his best performance of our routine yet! Trent also had his firsts. He is now a back to back winner of All Star JJ in Dallas! ANd he had to dance twice – and he won 3rd with his other partner! He was also invited to dance in the invitational JJ – a big honor at Dallas Dance, and a goal of his for over 20 years. He drew the incredibly talented Stevie Blakely and they proceeded to have one of the best dances I’ve ever seen from Trent. And they came in 6th! Amazing for going up against some of the best of the best in the country in WCS. I was supremely proud and happy! Dang, I had not realized that it had been so long since I did an update. Holy moly. Three dance convention weekends in a row – I have no idea how long this is going to take to recover! 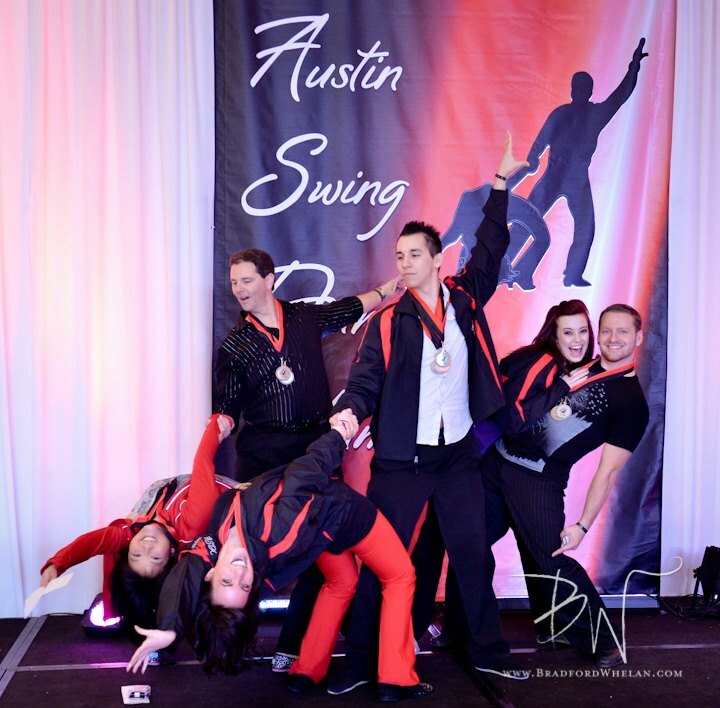 First up – Austin Swing Dance Championships! This is a 2nd year event and I think this is already on the lists of “MUST” dance events! The event is well run by event directors, Rick Domalski and Angel and Debbie Figueroa, and by the Chief Judge, Mike Topel. That was definitely one comment that I heard over and over again throughout the weekend – how on-time everything was and well organized. And even when there were issues, they were upfront about it and let everyone know so that we were prepared. Again, we really like the hotel and that there is some good eats within walking distance. The ballroom is a pretty good size (although it does get crowded from time to time – just means we got a lot of dancers!) and we really enjoyed the Texas style breakfast taco buffet at midnight! We also like that the event directors align themselves with a charity cause every year. This year it was with SafePlace.org, a charity that supports victims of domestic violence. They included a dollar dance to dance with your favorite pros ( I got Arjay this year!) and some of our Houston ladies got together and we donated 2 big boxes of clothing, shoes and accessories to the cause. Very happy to get to support the event! This event also includes a special Invitational Strictly Swing, where the Champions must choose an all-star partner. We thought this really added something special to the comp – I can’t wait to be a part of it (maybe next year?! ), while Trent got the opportunity to dance with the amazing Susan Kirklin. Victor chose the music – each couple got 2 songs, including a former routine song from the Champion dancer! Those who know their WCS history really had the advantage here – kudos to Brad Whelan and Deborah Szekely and Matt Auclair and Stevie Blakely for some of the most entertaining dancing I have seen! I also got to do both my routines during this weekend – first pro-am with Matthew and then Rising Star with Chip. At least they were two different days this time! Rising Star was Friday night and included some tough competition! I was a little nervous again, as I always am in front of my friends, but it felt great! We won 3rd place in that division. Saturday night was Matthew’s routine – this one is feeling better and better all the time as he continues to learn and progress in his dance. We didn’t place this time, but we got some excellent feedback from a few of our judges. Always appreciated! The final event of the weekend was the Swing Slam (previously the Golden Ticket). This really is a great way to keep the energy going late into Sunday afternoon. I absolutely love this tournament style format as it keeps the audience completely engaged and involved and keeps the competitors on their toes! The creativity that pours out of the competitors in this format is amazing. Something about the energy from the audience being right in your face and cheering their heads off!!! So congrats to Rick, Angel and Debbie for another successful event!